Where the music world now leads the way in the face of adversity and tragedy, the area’s footballers – including several from Wolves – featured strongly in the show of defiance following similar atrocities more than 40 years ago. Images of the Birmingham pub bombings will still be stark in the minds of those old enough to remember them but the human race’s enduring spirit was shown again when a subsequent rallying call among the region’s clubs was royally answered. Geoff Palmer, Derek Parkin, Frank Munro, Mike Bailey and John Richards were the Molineux representatives in a charity game hastily arranged in the Second City in December, 1974 in support of the Mayor of Birmingham’s Disaster Fund. Twenty-one people were killed and 182 injured in explosions at two venues, the Mulberry Bush and the Tavern In The Town, on November 21. The wait to see whether there would be further attacks was a tense one but, like it has after the Manchester and London Bridge attacks, life went on as normally as possible. 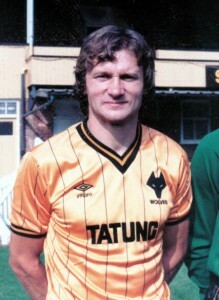 Also playing in the fixture were four more men who would later play for Wolves – Willie Carr, Mick Kearns, Alan Dodd and Ray Hankin. The match was between a West Midlands XI and an All Star team selected and managed by then England boss Don Revie. And Palmer’s participation was seen as a significant pointer to the future as he was named in the legendary former Leeds manager’s line-up along with Dodd and Hankin. The young full-back had been a late call-up for the European Under-23 Championship qualifying game away to Portugal in the second half of November and had good reason to remember that 3-2 victory as it was his free-kick that set up David Johnson’s last-minute winner. In a side jointly chosen in Lisbon by Gordon Banks and George Eastham, the Cannock-born Wolves fan was a replacement for Aston Villa’s John Gidman, who was still nursing an eye injury suffered in a Bonfire Night accident. Hankin and Barry Powell were on the substitutes’ bench. 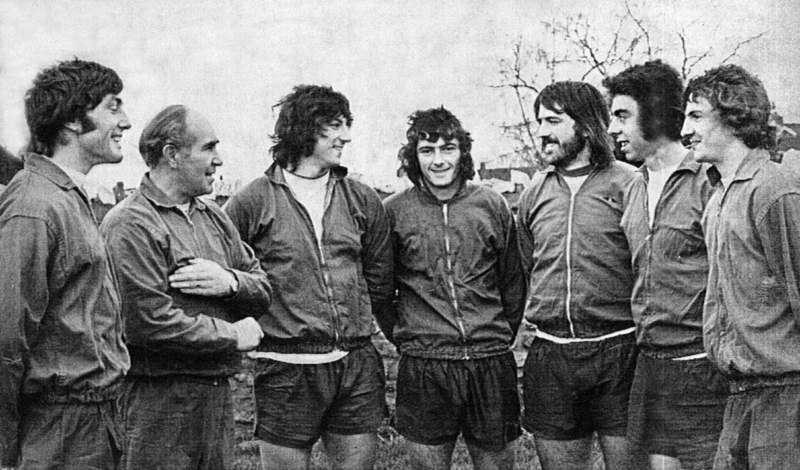 Geoff Palmer with Sir Alf Ramsey and (from left) John Richards, Peter Latchford, Trevor Francis, Bob Latchford, Geoff Palmer and Barry Powell. The fact Palmer had also faced Wales at under-23 level encouraged thoughts that he might be set for a senior international future when he was named for the December 9 clash at St Andrew’s that pulled in a wonderful 23,000 crowd on a bitterly cold Monday night. But eyes were quickly drawn to the opposition, Eddie Griffiths writing glowingly in the Express & Star about the performance of Richards – and of the entertainment value as a whole – in a 1-1 draw in which Gerry Francis and Tommy Hutchison scored the goals in the final 12 minutes. For Peter Shilton, it was another chance to impress in front of a West Midlands audience after he followed his £325,000 move from Leicester to Stoke on the day of the bombings by making an inspired debut in a 2-2 First Division draw at Molineux the following weekend. “I can remember being chuffed to be called up for the Revie team and I think all the players were glad to do something to help,” Palmer said. “The blasts were a horrible thing to be relatively close to, although I tended to stay in Wolverhampton for my nights out – at places like the Lafayette and the Connaught. I don’t recall being anxious going back to them in the weeks afterwards but we knew them so well anyway. “I wasn’t a frequent visitor to Birmingham and I think we just treated it as another game when we went over there. There was no particular nervousness about being there for the match, as far as I am aware. On view for the West Midlands XI were Gary Sprake (Birmingham), Mick Kearns (Walsall), Derek Parkin (Wolves), Ray Wilson (Albion), Mike Bailey (Wolves), Chris Nicholl (Villa), Frank Munro (Wolves), Ray Graydon (Villa), Howard Kendall (Birmingham), Alan Buckley (Walsall), Archie Styles (Birmingham), Willie Carr (Coventry), Colin Stein (Coventry), John Richards (Wolves), Kenny Burns (Birmingham) and Tommy Hutchison (Coventry). Alan Dodd…….joined up with representatives from the club he would later sign for. Representing Revie’s team were Peter Shilton (Stoke), Mervyn Day (West Ham), Geoff Palmer (Wolves), Ian Gillard (QPR), Gerry Francis (QPR), Paul Jones (Bolton), Alan Dodd (Stoke), Alan Hudson (Stoke), Duncan McKenzie (Leeds), Ray Hankin (Burnley), Tony Currie (Sheffield United), Dennis Tueart (Manchester City) and Peter Taylor (Crystal Palace). For the Wolves players in the game, it was a second visit of the season to St Andrew’s. They had drawn 1-1 there in the League at the end of August, Villa and Albion both members of the Second Division at the time. The Birmingham tragedies weren’t the only big headlines in November, 1974. It was also the month in which both Lord Lucan and Walsall MP John Stonehouse disappeared. Posted on: Friday, June 9th, 2017.